Make cupcakes and let them cool. Toast a whole bunch of coconut flakes by spreading them out on a rimmed baking sheet and baking for about seven minutes until they start to get a little brown. Frost the cupcakes and top with toasted coconut. Place three robin egg candies in the center of each one. Are you planning an Easter soiree? Well, you’re in luck. Whether it’s breakfast, lunch, or brunch, I’ve got two eggcellent ideas for your Easter table! These ideas are easy, economical, and adorable. It’s pretty much how I roll. For these Nest Egg Cupcakes, you can use any flavor of Betty Crocker™ Super Moist™ cake mix you like. 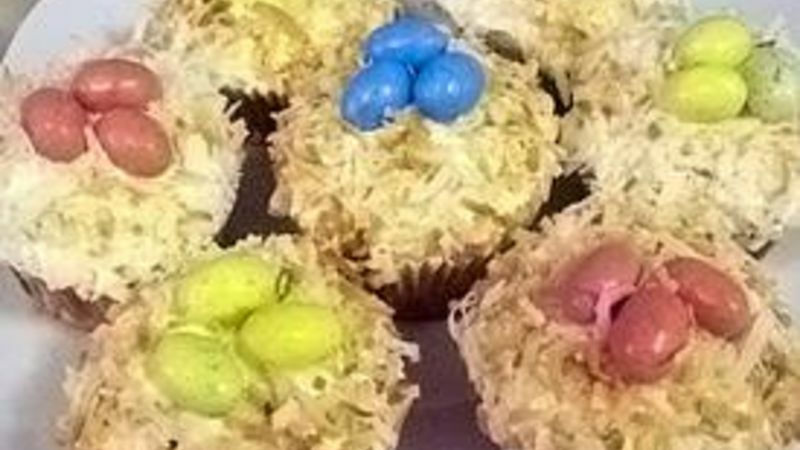 These cupcakes get their character and flavor from toasted coconut and robin egg Easter candies. Make cupcakes and let them cool. Toast a whole bunch of coconut flakes by spreading them out on a rimmed baking sheet and baking for about seven minutes until they start to get a little brown. Safety note: Do not accidentally drop the entire tray of coconut flakes in your oven. You will not be able to get them all out, and you will start an oven fire that will ruin your happy baking day. Nothing gets your blood pumping like smelling smoke and opening the oven to see a small coconut fire a-blazing. Ah, memories. Place three robin egg candies in the center of each one, and voilà: You’ve created adorable cupcakes that will impress your guests. For more on these cupcakes, check out my blog post. Go outside and collect a few good-looking tree branches. Better yet, if you have kids, let them do it. They’re outside, you’re inside with your feet up—it’s a win-win. Purchase or make decorated Easter eggs. I got my adorable polka dot eggs for about $5. These are also adorable! Place the branches in the vase and hang the eggs. Decorate with a pretty ribbon. Stuff the top of the vase with decorative grass for the final touch. Fill clear glass vases with colorful jelly beans and flowers for a splash of color. Use mini Easter baskets to hold place cards at each table setting. Make a table runner or place mats using wheatgrass for a natural look. So don’t stress! With these Easter ideas (and the bonus tips), you will have the cutest table around.